Global Climate Page | Watts Up With That? Florida State University – Department of Earth, Ocean, and Atmospheric Science – Moe – Robert Hart, PhD. Notice that quite a number of charts end in mid-2010, now going on a year ago. Why the dilatory updates? Great resource! Digesting diverse measures in detail curls one’s toes. Are the graphs real time? But isn’t there a sea level graph going back much further in time (like several hundred or thousand years)? I have been looking for a much longer time period of history that correlate world events with climatic events eg LIA with famine, plague, witch burnings, crop failures, wars etc and MWPeriod with growth of wealth, cathedral building, improved living conditions, and/or wars, territorial expansion. Can anyone point me to such a resource? The concentration of the above graphs starting from about 1970s – which I know is based on introduction of different technologies – seems silly to me because many cycles are much longer than 70s to present. You have to live long enough to experience a change or two in the cycles to see that, really, there is little change occurring that is not natural. The 1950s were extremely wet in Australia, as were the 1970s, the 1990s were also wet and now we are back in the wet cycle again. We experienced the 1968-70 drought in Central Qld which caused us to study local area rainfall charts that started in 1863. This revealed there were two 11 year cycles that followed each other. One cycle was wetter, the other dryer; some of these 22 year cycles were dryer than others, while others were wetter. The first half of the 20th Century was generally drier than the second half, and it seemed silly for the Climate Change proponents to choose the beginning of this period as the start of their claims that the changes were dangerous. The climate changes all the time. Accepting this and adapting to it is a much more productive way than spending billions to control something beyond our control. 1981 was a really bad ski season! The Global Climatic History Page was intended to present only regularly updated measurement data. There are a number of new Reference Pages in progress, but a Global Paleoclimatic History Page will be added to the cue. This sentence should bet put up in bright flashing lights. We need to get this message across to our dopey government and of course the MEDIA. references added by comments adds additional information. A great teaching aid. A copy of this should be sent to every legislator. Even including the few graphs going back to the 1850’s, these are such a short time span that it doesn’t take into account what has happened previously, to compare and look for trends over many thousands of years. Its normal for the media to take the information that looks sensational and run with it. Is there a Global Precipitation historical chart? 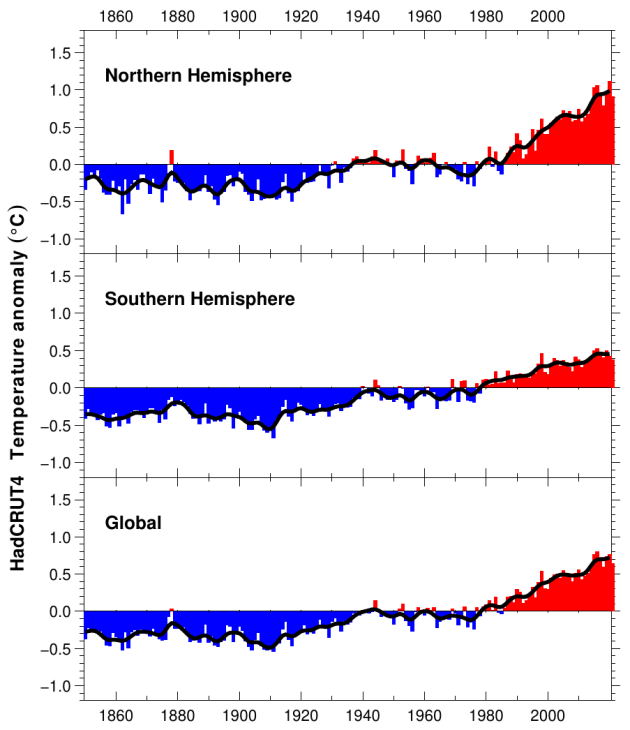 Something appears to amiss in the chart on global ocean heat content. If it were true that the heat content of the oceans has gone up 300% in 50 years, the pro- AGW people would be ecstatic and broadcasting that fact? unceasingly on all the networks. Global sea level since 1700: see “Recent global sea level acceleration started over 200 years ago?”, Jevrejeva, S., J. C. Moore, A. Grinsted, and P. L. Woodworth (2008), Geophys. Res. Lett., 35, L08715, doi:10.1029/2008GL033611. 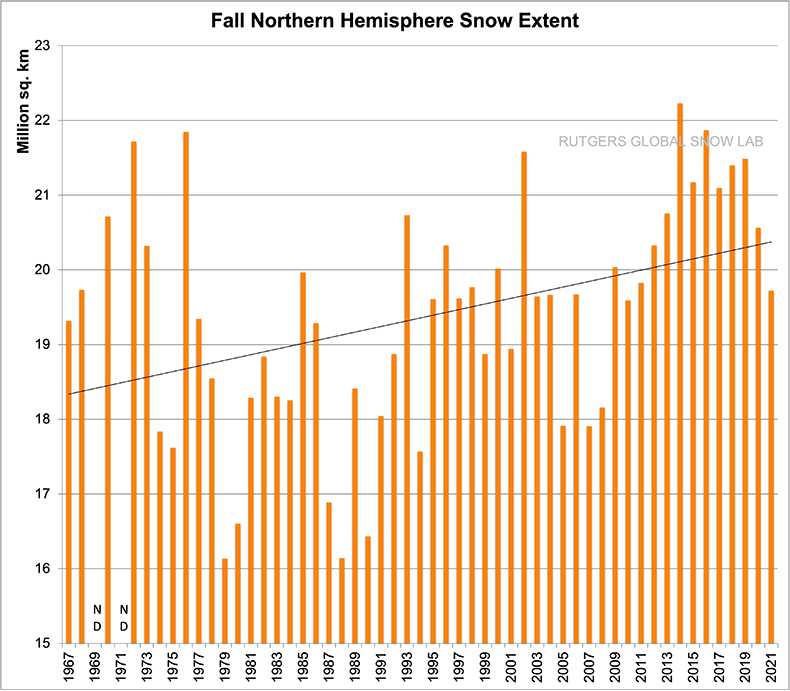 Looking at the very bottom chart, “20 Year Northern Hemisphere Snow Cover”, I see on odd pattern in the anomaly % graph. The first years, 1992, 1993, 1994, show a well defined cyclical variation, but then, starting in 1995, the anomalies become very chaotic. Why is this? Is this just an artifact of poor data for the first few years? The title of this page is misleading. 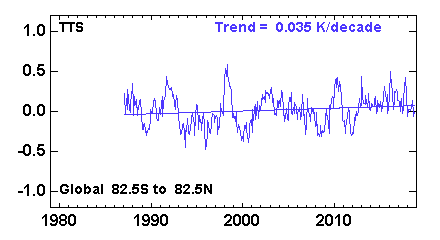 Most of this data refers to weather,not climate.and only relate to but ONE datum point on the Climate graph. This lack of perspective is very counterproductive and dogs many of the issues raised on this web site. Perhaps we should have a reminder graph at the top of this page which shows that our planet is on the downward path of a short [in climate terms] warm interglacial period in our history as we move into the next ice age.? And perhaps also data showing the relationship between CO2 levels and global temperature going back millions of years. 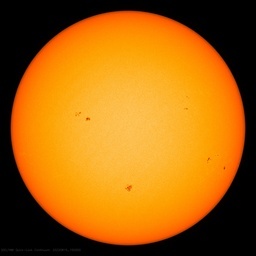 PS: As an aside two questions:: Has anyone yet produced a machine driven by the greenhouse effect? And: Does the IPCC definition of FR [forcing rate in W/m^2] comply with thermodynamic law, in that it appears to cross a boundary between two systems without causing a change of state in the recipient system? The title of this page is misleading. 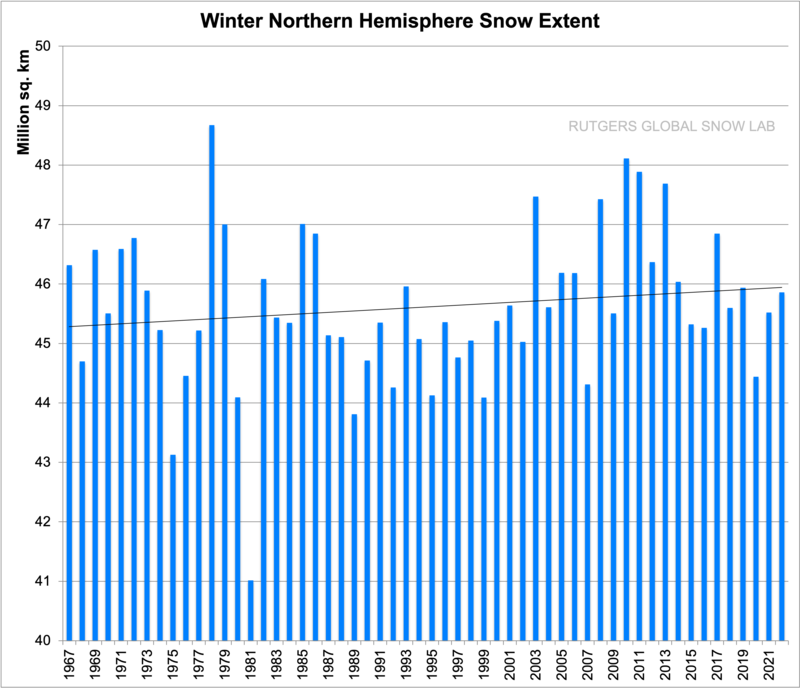 Most of this data refers to weather,not climate. When I get time I am going to make this page into the Short-Term Global Climate Page and Create a Long-Term Climate Page. 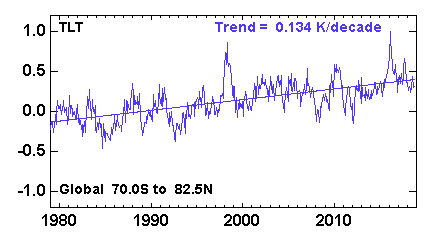 The link to “Global Mean Sea Level Change – 1993 to the Present” needs to be fixed. It takes us to a graphic on specific humidity. Thanks..
Scientists don’t use the start date of the 1970s to look at Global Temperature trends as evidence of AGW – –as you say, that’s too short a time frame. They start when fossil fuel burning started to pick up –typically, mid 19th century or a little later. What’s the basis for your assertion that adaption is wiser than mitigation? Suurces? My recommendation on this topic:: “The Climate Casino” by Yale’s William Nordhaus. A thorough treatment of the economics of adaption vs mitigation. We are (obviously) on a question-and-reply type format. After comments ease – or after you have resolved such issues and corrections as may be required, do you anticipate “closing reply” box and presenting the data as in the Solar Reference Page and Sea Ice Page? True “scientists” know that atmospheric CO2 was NOT influenced by man’s contributions until 1945. Show me your values that show man’s release of CO2 significantly affected total atmosphere ppmv prior to 1945. Temperature increases in 1840 – 1870 were almost as fast as those between 1915 – 1940, and 1915 – 1940 was the same as 1975 – 1996. Atmospheric CO2 has indeed not been higher than prior peaks of the Milankovitch cycles until after 1945: http://climate.nasa.gov/evidence — which has nothing to do with the correlation and causal relationship between rising CO2 and temperature. In the MIlankovitch cycles, temperature rise caused, and thus led, CO2 rise (CO2 being driven from the oceans), whereas since about 1850, the fossil fuel combustion driven CO2 rise from a base lower than the MIlankovitch peaks has in turn driven, and led, temperature rise due to the Greenhouse properties of CO2. Both casual relationships are operative at all times: In the 19th and 20th centuries, the temperature-driving CO2 causal relationship amplified the original temperature effect, as one of several factors leading to a net positive feedback on temperature due to CO2 increase, and a climate sensitivity of about 3C for a doubling of CO2 — a number verified multiple times by calculation from proxy data from multiple epochs in Earths prehistoric past. The Solar, Sea Ice and ENSO pages, are actually the outliers, as Anthony created them, thus comment notifications would go to him. Perhaps we should treat the Reference Pages more like Tips and Notes, and delete any comments that don’t add to the substance of the reference page? A strong comment for consideration and change! The first seven plots are clear with respect to source institute and range of plots. Very compelling information. BUT! But the titles below each plot (that part of the web page that we (you) are able to edit as a permanent label to the linked institution’s ever-changing web page) needs to include the reference period for each: 1970-1990, 1960 – 1980, 1990-2000, etc. Without thaose different reference dates, the apparent differences between each of the seven temperature records becomes very, very confusing. Is May 2014 +0.17, 0.75, 0.50, 060, 0.25 degrees? 2. You knew there had to be a “2” didn’t you? 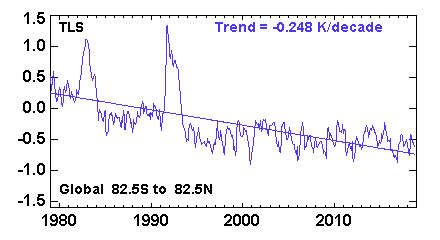 Add please the Antarctic long term temperature trend (it has been negative for many years!) 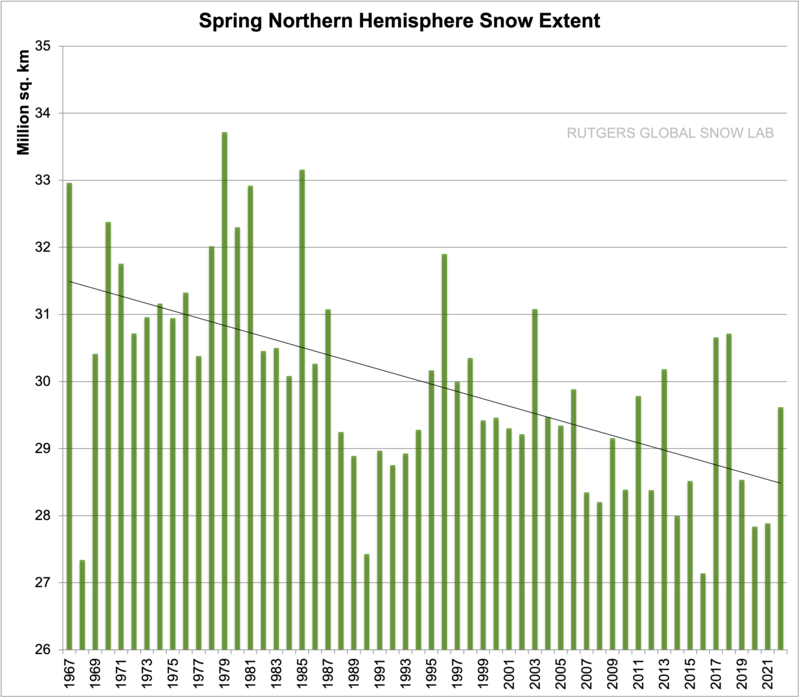 below the long term Arctic trend. That source can be the same as on the Sea Ice page. In the MIlankovitch cycles, the CO2 rise occurs in time frames of the order of one, or a few 10s of thousands of years, much faster than the more gradual downtrend at end of cycle. In contrast, the rise in CO2 that began in the early to mid 1800s has occurred in < 200 years — two orders of magnitude faster than Milankovitch CO2 increases. Your statement does nothing to disprove the conclusion that this < 200 year-long rise in atmospheric CO2 rise is the consequence of mans addition of Greenhouse gases to the atmosphere. What was the increase in global average temperature based on that change in CO2 on each of those dates? You asserted that the CO2 rise cannot be attributed to man. Show your evidence that invalidates that it has. My case is that of the IPCC, backed up by evidence and the Science. I welcome your evidence that disproves this case. My case is that of the IPCC, backed up by evidence and the Science. Rather “My case is that of the IPCC my chosen priests of my religious faith who are rewarded based on their faith in my religion, backed up by evidence that I refuse to present (because I refuse to present information that contradicts my religious faith) and the Science my sacred Text as written by the chosen priests of my religious faith.” Well, that is what you mean, right? I welcome your evidence that disproves this case. CO2 levels were steady. 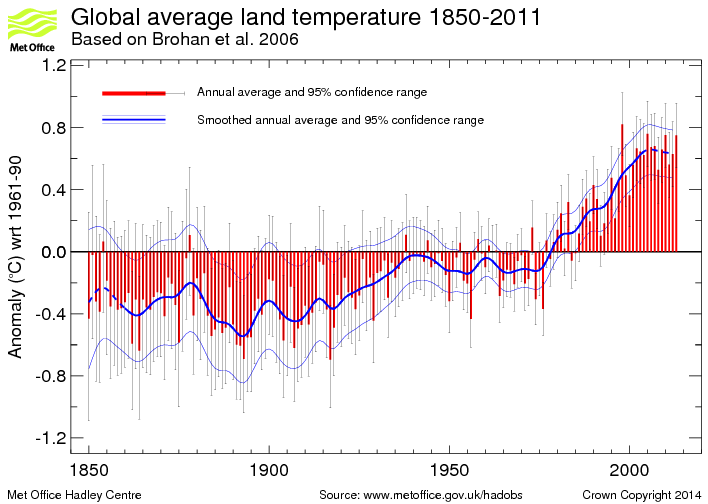 Global average temperatures rose at the same rate they were rising between 1975 – 1996. CO2 levels were steady, temperatures were steady. CO2 levels were steady, temperatures fell at the same rate that they fell between 1945 and 1975. CO2 levels rose, temperatures fell. CO2 levels rose, temperatures were steady. CO2 levels rose, temperatures rose at the same rate that they rose when CO2 levels were steady. I told YOU to show by specific evidence HOW MUCH of the CO2 increase at each of seven specific dates was due to man’s release of CO2. YOU are the man demanding tens of thousands of innocents die because YOU want to unnaturally and artificially restrict CO2 emissions worldwide. “I” am merely trying to get YOU to admit in public exactly how little of the CO2 increase that did occur was emitted by man at those specific dates earlier in history. YOU refuse to provide those values because those numbers prove YOUR theory is wrong. Certainly any comment that you think detracts from a reference page, feel free to delete. These reference pages are a collaborative effort, if you see something missing, e.g. the range of plots on a label, please feel free to update it. Anomalies are computed by subtracting the mean monthly value (averaged from 1979 through 1998 for each channel) from the average brightness temperature for each month. “Why do some of the products use different reference periods? 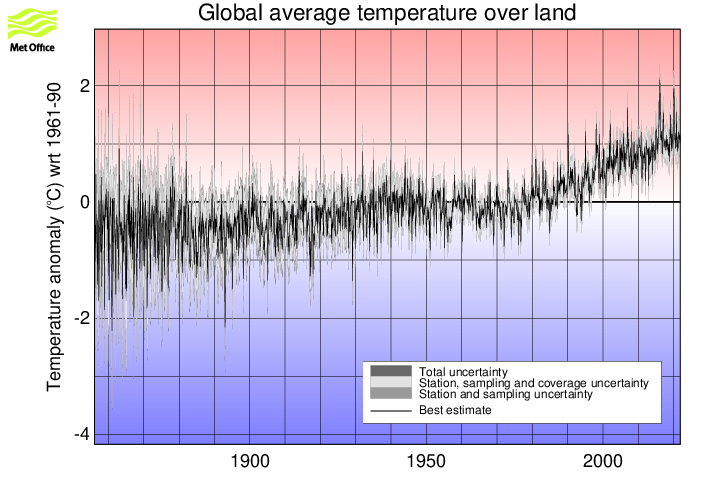 The maps show temperature anomalies relative to the 1981–2010 base period. This period is used in order to comply with a recommended World Meteorological Organization (WMO) Policy, which suggests using the latest decade for the 30-year average. For the global-scale averages (global land and ocean, land-only, ocean-only, and hemispheric time series), the reference period is adjusted to the 20th Century average for conceptual simplicity (the period is more familiar to more people, and establishes a longer-term average). The adjustment does not change the shape of the time series or affect the trends within it. NOAA’s Climate Prediction Center has already changed their Normals to the 1981 – 2010 base period? Why are those Normals not available? NOAA Climate Prediction Center’s CAMS station temperature anomaly dataset. “CAMS” is an acronym for the “Climate Anomaly Monitoring System” in use at the Climate Prediction Center (CPC). CAMS station surface air temperature anomalies for the globe with respect to the 1971-2000 climatological base period. I’ll begin to add base periods when I get an opportunity. 2. You knew there had to be a “2″ didn’t you? to the “Global” Climate page, as this page is broader than just regional temperature. The Global Temperature page has Northern and Southern Hemisphere sections at the bottom and I’ve added the RSS Northern and Southern Polar Temps there. I also might build out a Regional Temperature page when I get an opportunity. I have found no evidence that Anthroprogenic CO2 emissions were a significant influence on atmospheric CO2 concentrations or Earth’s Temperature, prior to 1945/50. Can you present any evidence? Mainstream science conclusions are similar, but not as black and white as yours. The analysis and evidence shows anthropogenic contributions as non-zero, and less than natural forcings up to around 1945. After that, anthropogenic forcings accelerate. See! I agree with you. Now, WHAT WERE THOSE CONTRIBUTIONS before 1945 due to Man’s release of CO2? Nothing else. Just man’s CO2 release. That is, after all, why YOU are demanding the death of millions more innocents each year between now and 2100 – to stop the future releases of CO2 into the atmosphere. If today’s releases of tens of billions of tons each year for 17 years have no effect on temperatures, surely you have some evidence somewhere that 1/1000 of that much CO2 released over 50 years had – what “more” effect on global temperatures? If satellite measurements “prove” a release of tens of trillions of tons of CO2 into the air between 1979 and 2014 increased global temperatures by 1/5 of one degree in 45 years, surely the release of 1 million, 10 million, 100 million, or even 1 billion tons of CO2 between 1800 and 1945 would be demonstrable, right? Surely you do not condemn millions to death for no reason but the “hand waving” of your so-called experts, do you? What are those numbers: How much do you believe temperature rose each year prior to 1945 due to man’s release of CO2 between 1800 and 1945? By the way, once you have decided on what those man-caused temperature effects – due to CO2 alone! were between 1800 and 1945 … You can go ahead and try to figure out why all of the natural changes that were happening prior to 1945 are not going on in the 60 years after 1945. Name calling and mysticism. I want no part of either –you may stay in your cave –alone. What names? I “did” point out that you are the direct cause of thousands of innocent deaths in the UK, but …. So, you refuse to back up your so-called “science” with numbers. Figures. See, if you did understand the actual simple numbers involved, you would see the fallacies of your claims about the influence of man-released CO2 before 1945. And, for that matter, after 1945 as well. But, because you do NOT want to see these errors, you refuse to answer a simple question requiring only simple arithmetic. Typical. Funny, these things called numbers. Odd that the so-called warrenlib refuses to even do the math. and, you know, you’d figure after 200 billion of paid research, we would know how much of the stuff is there. Now Trenberth, NCAR, in 1994 wrote up 5.1441 x 10^18 kg, but then NCAR corrected that value and is now using 5.1353 x 10618 kg. Since Trenberth has not been found correct before, I’m tempted to go with the NCAR number as the most accurate answer – because, obviously, it is the one with the highest number of digits! Thus, if warrenlib agrees, we will use NCAR’s 5.1353 x 10^18 kg as the atmospheric mass. More important, then, can all readers agree that N2, O2, and Ar are the most important non-IR absorbing gasses? If so, can we consider them constant while looking at the small number of tons of CO2 emitted by man? If so, would all readers check the following, since warrenlib apparently cannot? From this starting point, and the data in the graphs above on this page that assume a pre-1800 CO2 level of 280 ppmv, we should be able to determine how many ppmv’s of CO2 were emitted by man at any particular year in question, right? Links to datasets are at the WeatherBell page.